How much is Jimmy Kimmel Worth? 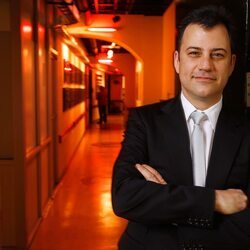 Jimmy Kimmel net worth and salary: Jimmy Kimmel is an American television host and comedian who has a net worth of $45 million. Jimmy Kimmel earned his net worth primarily thanks to his TV show "Jimmy Kimmel" live. He has also been successful in radio, television and in roles as a voice actor in animated films and television shows. He was born in Brooklyn, New York but grew up in Las Vegas, Nevada. 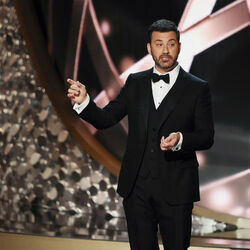 Jimmy Kimmel began working in radio before graduating from high school and dropped out of Arizona State University after two years to focus on radio work full-time. He began to gain a following when he was hired by KROQ-FM in Los Angeles. He had a regular guest spot on the popular "Kevin and Bean Show" on the station for five years, and then moved to television in the late 90s. 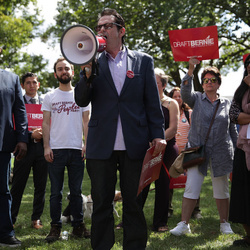 He was the comic foil to Ben Stein on the Comedy Central game show, "Win Ben Stein's Money" from 1997 to 2001, and won an Emmy for his work in 1999. He also co-hosted "The Man Show", and co-created and performed on "Crank Yankers", with Adam Carolla. 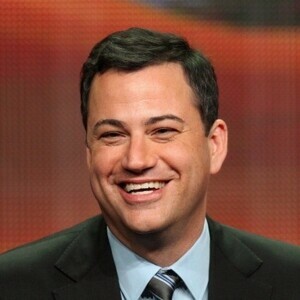 Jimmy began hosting his own show, "Jimmy Kimmel Live" in 2003 which slowly became very popular and successful. Jimmy has also served as a guest host for "Larry King Live" and "Live with Regis and Kelly". He has also become a popular host for award shows, hosting the Academy Awards in 2017 and the Primetime Emmy Awards in both 2012 and 2016. Kimmel was awarded a star on the Hollywood Walk of Fame in 2013 at 6840 Hollywood Blvd. His uncle Frank Potenza and cousin Sal Iacono also appear on Jimmy Kimmel Live. Kimmel has four children and married writer and producer Molly McNearney in 2013.